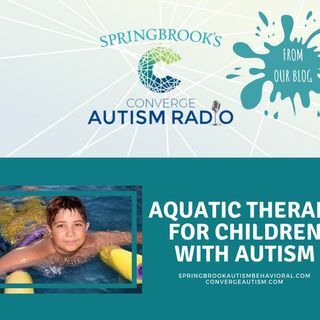 Join Melanie Vann and Kristin Walker for a discussion about how aquatic therapy is fun, safe, and effective for children with Autism. Children with autism are known to crave deep pressure. Water provides this through hydrostatic pressure, or the pressure that a liquid exerts when it’s at rest. Water exerts 30x more deep pressure stimulation on the body than air. More importantly, unlike pressure vests or weighted blankets, water completely surrounds and envelopes the ... See More child’s body, perfectly distributing an equal and consistent amount of pressure on all submerged parts of the body. The result is an especially calming environment that soothes children with autism, helps them organize other sensory inputs, and gives them more confidence to try new movements. Some of the obsessive, repetitive behaviors that children with autism exhibit, such as rocking and twirling, are directly related to an underdeveloped vestibular system. Children with autism usually engage in these activities because they are trying, by external measures, to develop a sense of balance. Unfortunately, these maladaptive modulations are also distracting and, too often, self-destructive. By contrast, moving around in water creates a controlled vestibular situation that is safe and more effective than other methods. Aquatic therapy for children with autism includes activities specifically designed to provide proprioceptive feedback. Proprioception, also known as your sixth sense, is your body’s ability to understand where it is in space—which is an ability that develops later in childhood, explaining why babies need to be held and why toddlers’ movements are erratic. For children with autism, this sense is usually underdeveloped, making them seem clumsy or strange in their movements. In water, the resistance children encounter when they move, the feel of water rushing past them, and the hydrostatic pressure when they are still all combine to give enhanced proprioceptive feedback and improve this sense.